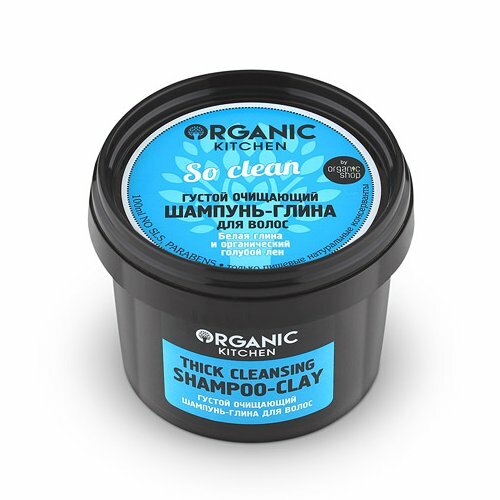 So Clean Thick Cleansing Shampoo-Clay is produced by the Russian beauty brand Organic Shop for its Organic Kitchen series. The product is suitable for all hair types. It is formulated with kaolin (white clay) and organic linseed oil. This shampooing clay cleanses the hair and scalp very thoroughly, removing dirt, excess sebum and styling products residue. SLS free, paraben free. Organic linseed oil contained in the shampoo nourishes the hair and restores its structure along the entire length. It makes the hair tamer, softer and silkier. White clay, also known as kaolin, helps to cleanse the hair and scalp, stimulates hair growth, strengthens the hair, and provides hair follicles with essential minerals. Organic Kitchen's shampoo-clay is enriched with cypress essential oil and schisandra fruit extract. Cypress oil strengthens hair follicles and restores the healthy shine of your hair. Schisandra (five-flavor berry) has a pronounced rejuvenating effect and provides the hair with vitamins and minerals. Directions. Apply onto wet hair, massage to lather, rinse. Repeat if necessary. Ingredients. Aqua, Sodium Coco-Sulfate, Lauryl Glucoside, Cocamidopropyl Betaine, Kaolin, Sorbitol, Organic Linseed Usitatissimum Seed Oil, Cupressus Sempervirens Leaf Oil, Schizandra Chinensis Fruit Extract, Glyceryl Stearate, Benzoic Acid, Sorbic Acid, Parfum. Want to buy So Clean Thick Cleansing Shampoo-Clay? Call us or submit your order via our web site! If it is possible for a shampoo to be too cleansing, this one is. Probably it's because of all the clay. I don't say that it's bad, it just means that this shampoo is not for daily use. I take it with me on business trips and vacations. It's small so it fits in my carry on, and it makes my hair squeaky clean after long trips.